Ecosystem-based conservation planning is applicable at the full range of spatial scales from large sub-continental and regional landscapes to small watersheds and individual patches or ecosystem types. In order to protect ecosystem health and biodiversity at all scales through time, ecosystem-based conservation planning needs to begin with as large a landscape as possible. The reason for this is to ensure that ecological processes are maintained throughout the region as planning proceeds to landscapes of multiple watersheds, to individual watersheds, and eventually to patches or individual ecosystem types. Silva develops ecosystem-based conservation plans so that the protected networks of ecosystems designed at each scale nest within those designed for larger areas. This approach not only provides for the most effective way to protect ecosystem health and biodiversity, but also results in an efficient planning system in terms of data interpretations, field assessments, map design, and structuring planning tools like geographic information systems and aerial photo interpretation. 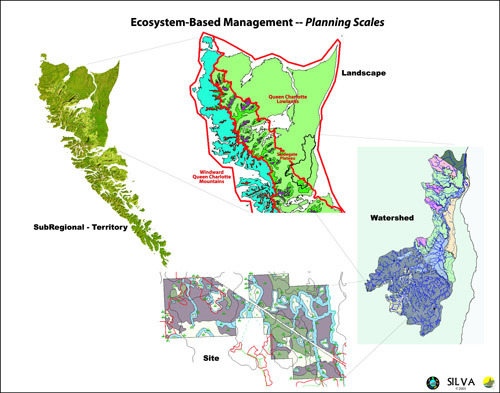 For more complete information about SFF’s multiple spatial scale process of ecosystem-based conservation planning, see our complete article.